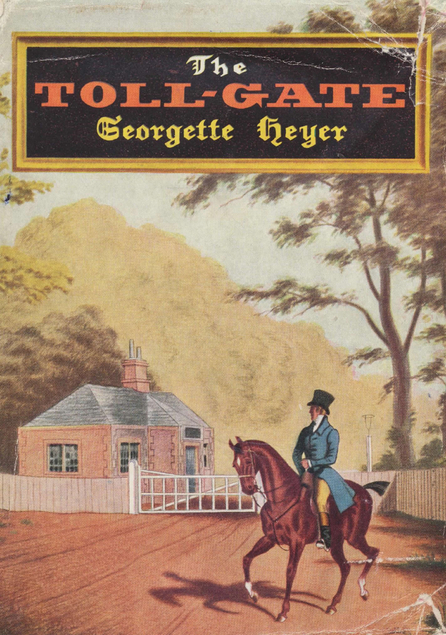 This entry was posted in Books and tagged Georgette Heyer, historical fiction, historical romance, Regency adventure, romance, The Toll-Gate by Katrina. Bookmark the permalink. A positive review of a Heyer always makes me happy. I haven’t read this one in a long time. I’ll have to pick it up again soon. I’ve just added all of her books to my notebook so I will know which ones I already have. I missed out on buying a couple in Edinburgh yesterday as I wasn’t sure if I had them or not. I still have a lot to get. Oh, this is so funny: at the latest library sale, I bought two Georgette Heyer books (Black Sheep and Charity Girl) in that same edition! I have yet to read either of them, though. This sounds like a good one. I have just read The Corinthian, which is another adventure story like this, and really enjoyed it. I’ve never come across any old fashioned toll-gates in England and assumed they would all have disappeared long ago, so it’s interesting that you found one so recently! I wish I could remember exactly where that toll-gate is. I still have to get The Corinthian but I have a few unread ones that I have to catch up with. Oh, Jack has just said that the toll-gate is on the A57 heading into Lincoln!